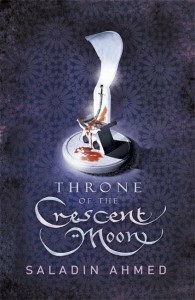 Starting out with a gruesome, gory prologue, Throne of a Crescent Moon got very close to turning me away before the first chapter even began. It's Pat Rothfuss's and Scott Lynch's blurby endorsements that made me read on. The novel is set in a generic Middle Eastern city, just to the side of reality and in a timeless pre-industrial period. The setting is influenced by Arabian Nights, but also by Persian, Bedouin and Ottoman themes. The story is that of a ghul hunter and his young (devout, strict, serious) disciple, facing up to the biggest demonic threat he has ever encountered. Along the way, we meet a magical girl who can turn into a lion, healers, magicians, religious police, deranged monsters, and a prince of thieves type. There's plenty of action and suspense, and, once the characters have a chance to interact, the story is engaging and entertaining. There are further battles / violent moments, but, unlike the prologue, they are all earned by the narrative, rather than trying to jolt the reader before there's any time to care about any of the characters. It's not on a par with Alif the Unseen (which is a fantastic novel set in a contemporary Arabian Nights inspired generic Middle Eastern setting), but it's a fairly entertaining read.